Epoxy coating systems for the finish that protects and beautifies. When thinking about your concrete floors and how best to protect and beautify them, look no further than epoxy coating systems. Epoxy is a polymeric system which bonds with concrete to protect it from water and other fluids, while providing decent damage protection. Epoxy refers to both the finished product and the polymers involved in creating that product. Epoxies are a class of pre-polymers and polymers which contain epoxide groups. Epoxy acts as a sealant for concrete. It also provides a very bright finish coat which draws out the luster of the floor itself. Epoxy has good damage control properties, although not as much as urethane, or polyurethane. In a light industrial application it is an excellent choice. Longevity and durability. Floors coated in epoxy last longer and are able to resist a lot of damage, water intrusion and impact damage. This longevity will save you money in the long run, not having to constantly re-surface a floor is both labor and money-saving. Once the epoxy has converted into a solid polymer it becomes an incredibly strong overlaying film. This strength prevents any chemical breakdown of the flooring material for a long period of time. Maintenance and cleaning. Due to the resiliency of the epoxy coating system, it makes it very easy and quick to clean up. The product when applied becomes an impermeable surface, so water and spills and oil cannot break through the barrier to get to the floor below. That makes any kind of cleaning much easier. Saves money and time during installation. Epoxy coating systems are generally easy and quick to apply, saving both contractor and client money in the installation process. They are also very easy to repair in case of damage, so overall an inexpensive choice in durable flooring. Epoxy resists most chemicals. 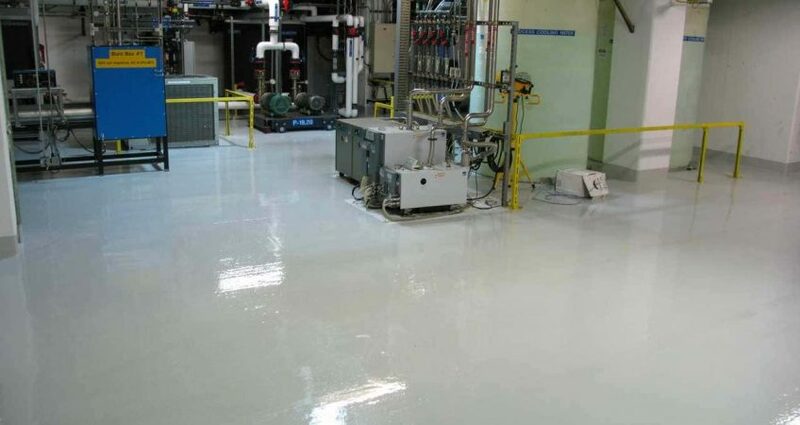 Epoxies will resist exposure to most chemical spills which makes them ideal for warehouse and workshop flooring. Even if the chemical sits on the floor for a long time, the epoxy will withstand it and clean right up. A safe material. Epoxy coating systems are resistant to slippage, temperature extremes and even fire. Depending on the type of epoxy used the material can be manufactured for heightened protection against UV rays and continuous freeze/thaw cycles. Most epoxies are non-toxic and considered only a mild irritant when coming into contact with mucous membranes. In the hardened or cured stage epoxies are harmless and emit no noxious vapors. Care should always be taken when disposing of liquid epoxy as it is harmful to aquatic organisms. Aesthetics and brightness of the finish. Epoxy resins come in a wide variety of colors and tints. They are great for colored floors or even designs on a floor or wall. The extremely bright finish coat helps colors and designs to stay radiant for many years after the finish coat is applied. Epoxy coating systems can be used in a variety of applications. Warehouses, stores, showrooms and garages all benefit from an epoxy flooring finish. Epoxy isn’t limited to floors, it can be applied to walls and ceilings with the same durability and brightness results. Ease in application. Epoxy can be either painted or sprayed, depending on the size of the job. As always, preparation is key. The surface must be completely clean and dry before epoxy can be applied. Failure to have a clean and dry surface will result in the epoxy coating system cracking and peeling. While you might want to add one or two coats, make sure the previous coat has dried and cured completely before layering on more. At Pli-Dek we offer various epoxy coating system products for the homeowner and contractor alike. When you are ready to learn more please contact us.